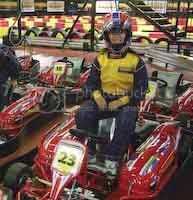 Some weeks ago we took R* go karting with a couple of friends at Teamworks Karting in Reading. Karting is always good fun. Heck, I like any motorsport. This was the first time I had tried electric ones. It makes sense for an indoor track and at 10hp, they could do 40 mph down the back straight. Fast enough. However, they do lack the excitement of a revving noisy engine and the smell of petrol and fumes. It’s just not the same! Give me petrol any day. The facilities at Teamworks were brand new and excellent. You can have up to eight karts on the track. It costs £30 for four 7 minute races. That’s plenty enough time.